Mulberry Conduit body of trade size 1-1/4-inches, protects and routes the rigid or IMC conduits through two threaded hubs oriented in 90-degree. This conduit body in smooth corrosion-resistant electrostatic powder-coated finish, features aluminum die-cast construction. Type LL conduit body with capacity of 32.3-Cubic-Inch, offers left side access to the conductors for maintenance and future system changes. 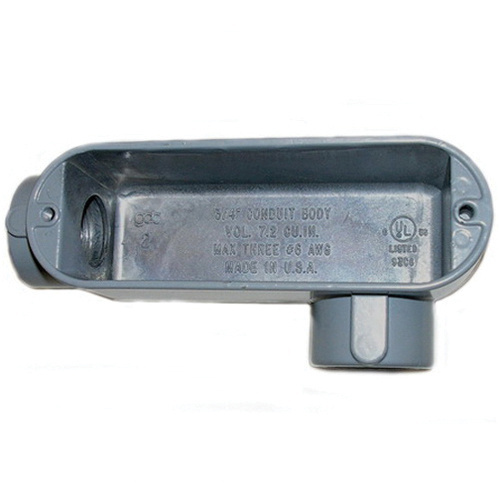 This conduit body comes with screw-on cover to safeguard the conduits from physical damages. It has a dimension of 7.860-Inch x 2.250-Inch x 3.410-Inch. Conduit body is UL listed.